TRUSTWORTHY PLUMBERS IN NORTH RICHLAND HILLS: The plumbing system in your home or business is crucial to the daily tasks that you have to get done each day. So, having a plumbing problem can put a real damper on your day. In fact, there are few things on your list of daily chores that can get done without a properly working plumbing system. Dealing with a plumbing problem is the last thing that you want to be doing. A good day can turn stressful in an instant – all from a simple plumbing problem. You are faced with both the overwhelming of a halt in your productivity, as well as the stress of scheduling a professional plumber to get the repair done. 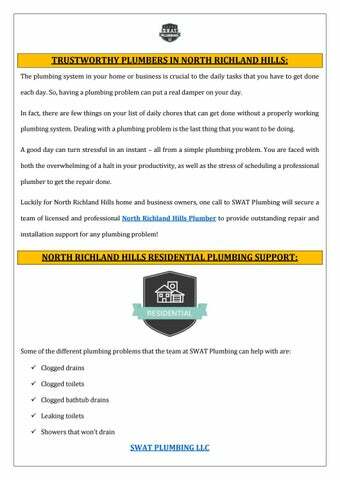 Luckily for North Richland Hills home and business owners, one call to SWAT Plumbing will secure a team of licensed and professional North Richland Hills Plumber to provide outstanding repair and installation support for any plumbing problem!  Malfunctioning water heaters  Leaking faucets  Low water pressure  Leaking garbage disposals Our team of professional and licensed plumbers have years of training and experience to help manage any plumbing problem that you might have! We are available 24-hours a day, 7-days a week for all of your residential plumbing problems!  Sewer line backups  Leaking pipes  And more! For years, our team of licensed plumbers have been helping North Richland Hills business owners with all of their plumbing repair needs! Call us today on 817-200-4937. PLUMBING SERVICES NORTH RICHLAND HILLS: Call SWAT Plumbing for expert water heater installation and repair services, no matter what the make, model or size of your system! We provide superior water heater installation and repair services for both standard tank and tankless systems. Your water heater is the “workhorse” of your plumbing system, and it must be properly taken care of. If you need exceptional water heater repair and installation support for your system – don’t hesitate to contact us! COMMERCIAL AND RESIDENTIAL DRAIN CLOG REPAIR SUPPORT: Whether it is a clogged toilet, slow-draining shower, or a sink that is backed up – one call to SWAT Plumbing will get you exceptional drain cleaning and clogged drain support! The licensed and professional plumbers at SWAT Plumbing understand how foundational your drains are to your overall plumbing system. That is why we provide the highest-rated drain cleaning support for any type of plumbing issue in your drain system. 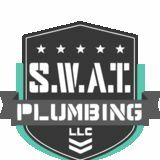 WHY WORK WITH SWAT PLUMBING? We are a top-rated Plumbing Services Fort Worth, and we have a well-earned reputation for providing superior plumbing support and customer service. If you need help with a residential or commercial plumbing malfunction â&#x20AC;&#x201C; give us a call! You can get a hold of us any time of the day or night! We know that plumbing problems do not happen during convenient times, and that is why we are committed to providing our clients with outstanding support around the clock! Luckily for North Richland Hills home and business owners, one call to SWAT Plumbing will secure a team of licensed and professional plumbers to provide outstanding repair and installation support for any plumbing problem! If you need help with a residential or commercial plumbing malfunction – give us a call on 817-200-4937 SWAT Plumbing of North Richland Hills Now For Help With All Of Your Plumbing Troubles! We are available 24-hours a day.